1. Designer waters. 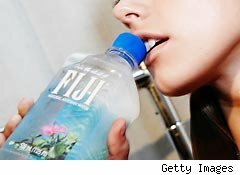 Regular bottled water is bad enough, but when it goes upscale -- that's when it really picks your pocket in the name of some marginal health claim. The Urban Dictionary defines "designer water" as "a commercial brand of mineral water, often served or sold under pretentious circumstances ... at exorbitant cost." Sounds about right. It's even worse if it's imported from some distant land (ie, Fiji) because then you have to add transportation-related emissions to its demerit list. The bottles are beautiful, but as with celebrity-endorsed perfumes, that's what you're paying for -- a fancy bottle.2. Wind-up Radios. Life is too short to worry about the tiny amount of electricity consumed by a small electronic device. A clock radio consumes a mighty one watt. Crank for a minute to get half an hour of listening? No thanks. Of course, this is core gear if you're a survivalist -- you're going to want to stock one next to the MRE's and the emergency flares. 3. Flexible-Fuel Cars. E85 ethanol may have its uses in reducing emissions, but flex-fuel vehicles often grab clean car credits without actually having to run on E85. The evidence is that most rarely see the stuff, especially if they're located outside the Midwest, where the ethanol stations are concentrated. We need to either create an E85 infrastructure or stop making extravagant claims for flex fuel. 4. Natural Health Bars. These bars are generally high in fiber and/or protein, but they're also loaded with calories -- the typical count of 230 in a meal-replacement bar is more than a cheese sandwich. And when they're loaded with dried fruits the sugar content goes through the roof (expect 12 grams per serving -- sugar is the likely source of more than 30% of the calories). Check the saturated fat content, too. According to this site, a Strawberry NutriGrain bar has 12 grams of sugar -- as much as five packs of SweeTarts. You'll have to bike 20 minutes to burn it off. 5. Dishwashing Liquid. It is vitally important that dishwashing liquids actually cut the grease and clean the dishes. It's great when they're free of phosphorous and bleach, claim coconut as an active ingredient and use biodegradable preservatives, but if the $8 bottle of Green Clean doesn't actually scrub as well as the $2 bottle of Dawn, we're in trouble. The foaming agent in dishwashing liquids and other products, sodium laureth sulfate (SLS), is the target of green campaigns, and I'm sure deservedly so because it's a known irritant, but unfortunately it's cheap, efficient and very good at what it does. And there's no simple natural replacement. Sigh. Become a fan of Consumer Ally on Facebook. At the Ultra-Green W Hotel, $6 for Fiji Water. What's Wrong With This Picture?